Year 1950, the place was a part of the jungle area of the barrio Alegria. Tall Lawaan trees were fully grown in a meter distance apart. Rattan was coiling the ground while above the trees are the blissful monkeys, Philippine Eagle, wild bores and giant pythons were thriving there. The furry flora and fauna were abundantly found. The natives called the place MANAG-AS because of the tall trees and green woods that can be never surpassed among the virgin forest of the hinterlands of Alegria. It was in 1960’s when Montilla Logging Enterprises operated in the place, which gave the total change of the image of the natural wonders, situated in the place. This logger toppled down trees and they neither know nor did expect that this will cause a great damage in the future. A logging camp in the area occupied and established by Santos Martisano. It was so progressive and successful that the logging firm employed people living there. Soon the place was able to generate an improved population. The logging camp was called CAMP EDUARD. And when the logging firm stops its operation, the people living there petitioned for recognizing the place into barangay. 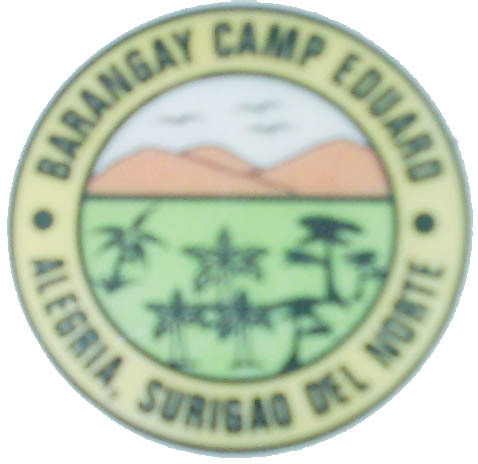 This appeal was headed by Mateo Bunga who was then acknowledged as the first Barangay Chairman of the place, which is now known as Barangay Camp Eduard; the name taken form the logging firm and was established in August 22, 1971.